A first of its kind, 3D video is coming to home television sets with the help of next-generation Blu-ray Disc technology. 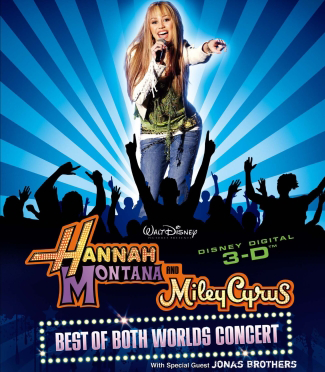 Hannah Montana and Miley Cyrus: Best of Both Worlds Concert Tour, to be released by Disney (Buena Vista Home Entertainment)on August 19, will feature both 2D and 3D viewing options in 1080p. The audio is also getting the royal treatment with uncompressed PCM audio in 7.1. It is unclear if this works on all TV sets yet. Mitsubishi is developing a player to convert 2D images to 3D, and they’ve also been working on including 3D support in their upcoming Laser TVs. I haven’t heard if the 3D Blu-ray would play on a CRT, or RPTV though. You do have to wear glasses, however. The movie will retail at $35.98, but I imagine you can pick it up (for your pre-teen daughter of course) on Amazon for less.